Most brand models focus on transactions. Here's a new brand model that's better. 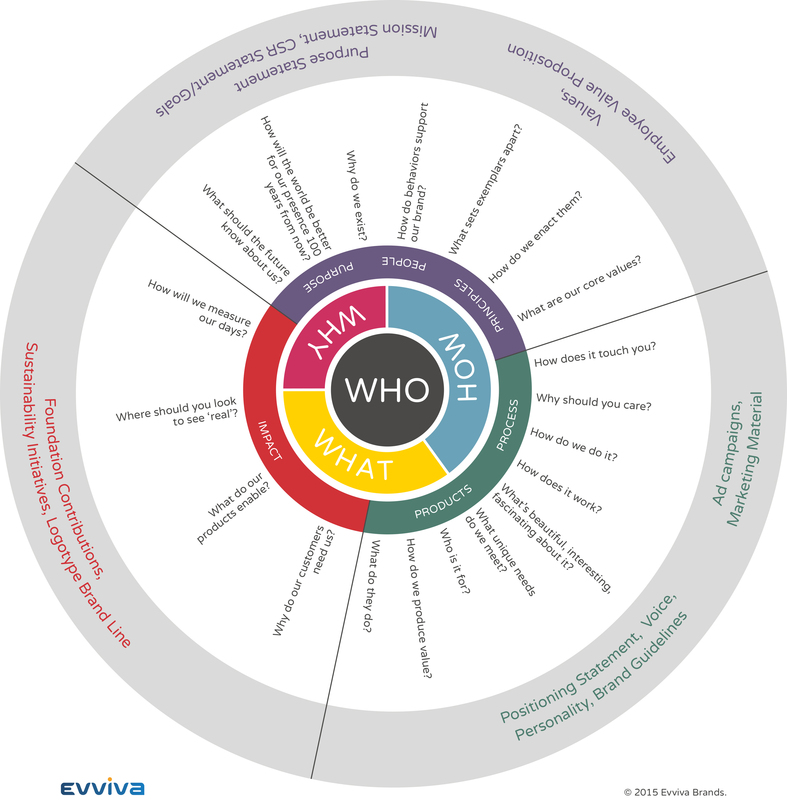 It focuses on the essence of the essence: how + what + why = who. LET’S FACE IT: if consumer insight teaches us anything it’s that we’re very, very similar. When the research is presented you can almost hear the crescendo toward the key consumer insight. If you’ve sat through a few of these presentations, you already know your first reaction will be, “that’s it?” You also know that over time, you’ll become fascinated–maybe even obsessed–by what the “that’s it?” insight reveals. Turns out that within that sea of sameness there are substantial shoals. Marketers see the key insight as a trigger. Their first inclination is to put it to work in service of conversions and transactions. That’s a good instinct: it works. But there’s a more important application for these insights. They can help us toward a new brand model. First: what people do for a living isn’t an afterthought. Work is an active identity, one people form. And in turn, work forms them. During their working years, most people spend most of their time doing a specific set of things and interacting with a particular set of colleagues. Over time, they gain greater skills at the things they’re doing. So do the people around them. As the years pass, they grow as a skilled cohort group together. Second: as they become more skilled, how well they are understood to do what they do by their cohort group becomes both increasingly visible and increasingly important. And third: the people who are the most passionate about the work will probably become the best at it–however best is measured in their community, or tribe. The same is true of organizations and brands, but more so, because they’re so much simpler and the rules governing their behavior (their marketplace), their success or failure (their revenue or impact) and their expressions of identity (their brand) are the result of purposeful, rational thought and debate. So a new brand model that effectively addressed the character-revealing facets of work could apply with equal force to individuals and to companies. The golden circle is powerful, but there are still more powerful ideas hidden in plain sight. Why should we care about “why?” Because despite our willingness to exchange the limited days of our lives for money, what that time is spent on still matters a great deal–both because of the interdependence between character and activity I mentioned above and because, like it or not, our choice of workplace reflects on each of us in very personal ways in our cohort tribe. And follow Sinek’s logic to its conclusion and every competing organization must necessarily be a different mix of “how,” “what” and “why.” Together, the venn diagram of these three elements creates a singularity at the center: who. Simply put, how, what and why describes who. Or maybe creates it. We’re pretty excited about the workforce implications of that simple idea. It offers a strong, simple, robust way to organize data and almost unlimited number of possible variations among similar patterns. (Think of the power and infinite variety of ATGC.) As I said earlier, we believe it offers the foundation for a new brand model. But as much as we love the metaphor of DNA, for an agency, the best way to visualize this new brand model doesn’t come from DNA. It comes from colors. Just as four amino acids can combine in endless variations to make all life on earth (and you), just four true colors–cyan, magenta, yellow and the key color black–can recreate everything we see in CMYK. The largest challenge brands face every day is delivering purposeful consistency. So a new brand model that created a useful structure based on the combination of brand personality drivers (what, why, and how) that express identity (who) would be a huge improvement over most models today. We should ask, “would our cheese shop at Safeway?” But we don’t. Because our brand model is thin. And if we’re honest, we just don’t know. It’s not possible to show how this new brand model would apply to a given company without doing the brand development and we haven’t yet had the opportunity to do that. But it’s easy to demonstrate how the “CMYK model” would massively improve the integration of message, motivation, ownership and purpose. This model can be read from left to right or right to left, but I’ll start on the left. As I observed above, who is the combination of how, what and why. “How do we measure our days” (in terms of the impact we have)? All of these are questions of impact. To the right are the products of these questions, ranging from the logotype and brand line to foundation giving and sustainability. Combine cyan and yellow: you make green. 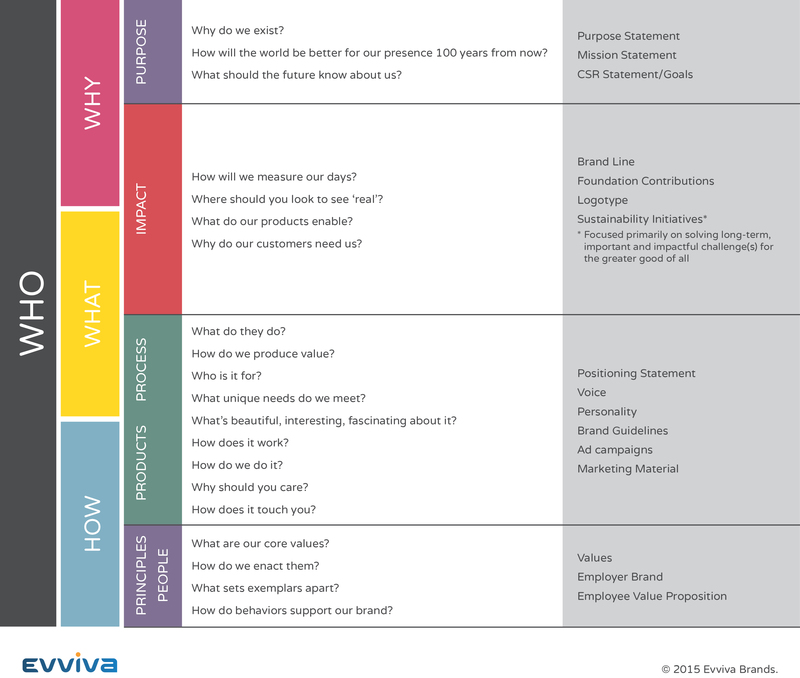 Combine “how” and “what” and you define the products (or services) a company makes and the process they’re made by. Understanding this brand element requires one to understand some very basic things, like “what do we do?” and “how does that produce value?” But it also requires us to ask customer/user/buyer-driven questions like “why should you care?” and “how does it touch you,” either literally–the feel of an iPhone–or metaphorically–the feel of an iPhone you imagine after watching an Apple ad. Each of these questions begins to define products and process but to be useful, they should be carefully answered in a competitive context. The main reason the surface feel of an iPhone matters so much is that the competition hasn’t yet mastered surface feel. As before, the products of these questions are listed. You may notice the lion’s share of the output of brand and ad agencies sits here. That’s no accident. Because it’s through the description of products and processes that most advertising is done. Combine cyan and magenta: you get purple. Combine why and how and you articulate purpose and principles and create most of the “moral messaging” framework that animates people. That requires thoughtfully–and honestly–answering questions like “why do we exist?” “how do we make the world better?” It suggests longer-range questions, like “what should the future know about us?” And it requires us to document our core values, and the behaviors that express them. Most usefully, it connects the behaviors of employees to the brand itself. This new brand model is far better than the traditional “brand pyramid” models you’ve probably seen for a number of reasons. It creates a clear hierarchy that subordinates products to identity. It forces the brand to take a long-range view of itself. It allows limitless flexibility in a system that nevertheless has a limited number of variables, making meaningful comparisons between similar brands possible. And it usefully balances tactical and strategic elements. But it could be better The purple content is important, but it jumps from the bottom to the top of the page. The arrangement of the colors implies a hierarchy it shouldn’t. And that all of this information comes together to define the “who,” the “brand person” at the heart of the model is completely lost without voiceover. Give it a try. We’d love to hear your results.